Seattle will pay outside attorneys up to $250,000 to help defend the city’s new income tax in court. The same law firm already had a $30,000 contract for work drawing up the tax measure. Seattle has agreed to pay an outside law firm up to $250,000 to help defend the city’s new income tax on wealthy households. Multiple lawsuits have been filed against the measure since the City Council approved it and Mayor Ed Murray signed it last month, with conservative heavyweights such as former Republican state Attorney General Rob McKenna lining up against it. Proponents knew the income tax would end up in court. 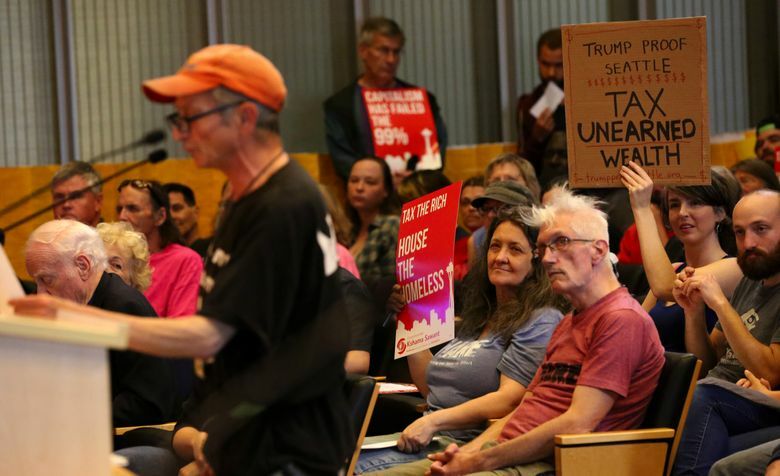 They see the Seattle measure as a test case that could lead to a fairer tax system statewide and estimate it can raise about $140 million per year. For assistance in the legal battle, City Attorney Pete Holmes has turned to Pacifica Law Group, a Seattle-based firm. The city will pay three Pacifica attorneys rates of $495, $285 and $265 per hour, respectively, with the firm agreeing to charge no more than $250,000 in total, according to a July 26 letter. In June, Holmes’ office signed a separate $30,000 contract with Pacifica for work on drawing up the tax measure. Even with the outside counsel, Holmes and his deputies will supervise the litigation, she added. “I trust the City Attorney’s Office to make a well-reasoned decision about who should be on their legal team defending the city’s effort to turn our upside down tax system right side up,” Councilmember Lisa Herbold, a sponsor of the measure, said in a statement. Before retaining Pacifica, Seattle signed a nearly $50,000 consultant contract with income-tax proponent John Burbank of the progressive Economic Opportunity Institute for help developing and defending the measure, Mercier said. The mayor didn’t immediately reply to a request for comment Wednesday. Mills said the help is needed because the city’s lawyers have their hands full. “Our outside counsel work has increased in the last few years because of the many and novel initiatives the council has asked for advice on, then passed into law,” Mills said in a statement. Several new Seattle laws have in recent years been tested in court, including measures setting the city’s minimum wage on a path to $15 per hour, allowing Uber drivers to unionize, requiring landlords to choose the first qualified applicant and capping move-in fees for renters. The city received pro bono outside help in defending its new tax on gun and ammunition sales, winning a decision from the state Supreme Court this month. Other major cases include a lawsuit against Monsanto over chemical cleanup costs and a lawsuit against President Donald Trump’s sanctuary-cities order. A review of consultant contracts shows 48 signed by Holmes’ office this year, including seven with Pacifica. The firm’s 2017 contracts with Holmes’ office total more than $400,000. When Holmes came into office, he ended an exclusive outside contract for cases involving the police department, bringing that work in house, Mills said.